Located just three and a half blocks from the Canoga-Owensmouth Historical Museum, the artwork conveys the urban and botanical history of the area. Centered on the free-flowing Los Angeles River, a stone and glass mosaic paving pattern on the east platform depicts a map of the Owensmouth area as it existed in 1910. Small, urban centers are located alongside the river. 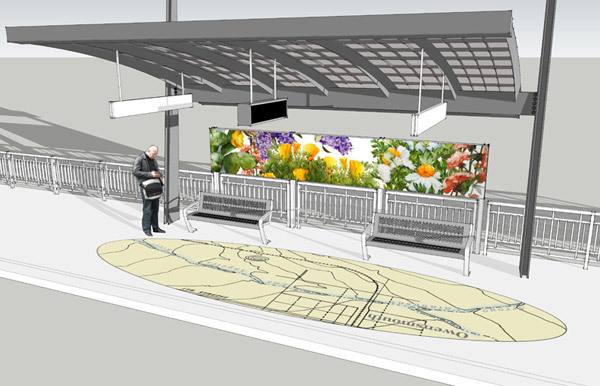 A collection of native plants that thrived on sandy banks bloom on the enamel steel art panel alongside the platform seating: pear cactus, California poppy, wild lilac, Clarkia and Matilija poppy. On the opposite station platform, an elliptically shaped stone and glass mosaic presents the same section of the river forty years later, in the area renamed Canoga Park. In this image the river has become part of complex urban geometry, contained by a channel and surrounded by housing tracts. Lush, green, imported fruit trees, heavy with oranges, lemons, and peaches dominate the seating area art panel imagery, suggesting civic growth and domestication of the landscape as a pair of linked processes. "I want commuters to connect to the earth beneath their feet and to the plant and urban life surrounding them. They can walk on the ellipse-shaped maps that follow the course of the river, trace topographic lines, and lay out the city streets around the very station where they are waiting for the bus." MARGARET LAZZARI is Professor and Chair of the Roski School of Fine Arts at the University of Southern California. She is the author of Practical Handbook for the Emerging Artist as well as co-author of Art and Design Fundamentals and Exploring Art: A Global, Thematic Approach. Her paintings and drawings have been exhibited throughout the United States and Italy and are included in numerous public collections including the Cathedral Collection of the Archdiocese of Los Angeles; Kaiser Hospitals, California; Huntsville Museum of Art, Alabama; St. Louis University, Missouri; Azusa Pacific University, California; and Clark College, Iowa. Her work is represented by Addington Gallery in Chicago and Patricia Sweetow Gallery in San Francisco.